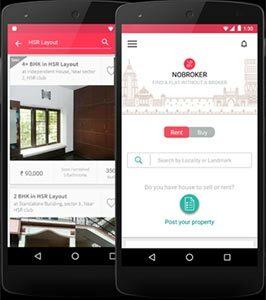 Bangalore-based NoBroker Technologies Solutions Pvt Ltd, which runs a peer-to-peer property listings business for renting homes under NoBroker.com, has raised $10 million in Series B funding. The investment was led by Beenext and Digital Garage along with Beenos, Qualgro and Mamoru Taniya of Asuka Holdings. Existing investor SAIF Partners also participated in the round that took the total funding raised by NoBroker to $13 million. The company plans to use the money to build its workforce, especially the tech team, and enhance the product offering, it said in a statement. Amit Kumar Agarwal, CEO and co-founder of NoBroker.com, said the funding will help it grow its customer base that has increased to 650,000 from 35,000 over the past 12 months. "We have seen this growth despite us moving from a free to a subscription-based fee model," he said. Agarwal claimed that the company's revenue is doubling every month and that the focus now is to turn profitable next year. The company was founded in 2013 by IIT alumni Agrawal and Akhil Gupta. Agrawal was previously an analyst at Cognizant Technologies, principal consultant at PwC and associate director at Australia New Zealand Bank. Gupta was an application engineer at Oracle and technical lead at PeopleFluent. NoBroker is a home rental platform that helps users find homes without paying any brokerage. It claims to have verified listings to make sure that these are direct owners or shared accommodation parties and there are no middlemen or brokers involved. The firm also provides users with a template to generate their own customised legal document for each rental. The platform claims to be enabling about 400,000 customer connections on a monthly basis across Mumbai, Bangalore, Pune and Chennai. In its last round of funding, NoBroker had raised $3 million (Rs 18.6 crore) from SAIF Partners and Fulcrum Capital in February 2015. It had raised an undisclosed amount in seed round from Saurabh Garg, an angel investor who co-founded the Four Fountains Spa chain, in 2014. Four Fountains is a portfolio firm of Fulcrum. Several online platforms for brokerage-free rental listing have attracted investor attention. NoBroker's immediate rival Grabhouse.com had raised $10 million (Rs 65 crore) in a Series B round of funding from existing investors Sequoia Capital and Kalaari Capital in October 2015. Zocalo.in, another brokerage-free listing platform for rentals and paying guest accommodation, had raised an undisclosed amount in seed funding from startup accelerator GSF's Rajesh Sawhney, MakeMyTrip co-founder Sachin Bhatia and others in August last year. Bangalore-based Nestaway Technologies Pvt Ltd, which runs an online managed home rental marketplace for singles by the same name, had raised Rs 76 crore (about $12 million) in funding from e-commerce firm Flipkart and its investor Tiger Global in July 2015. The digital real estate segment in India is dominated by companies such as Magicbricks and 99acres. Housing.com, PropTiger and QuikrHomes are among the other main players. News Corp, which holds a significant stake in PropTiger, also owns Mosaic Media Ventures, the parent of this website. Beenext Beenos Asia Pte. Ltd. NoBroker Technologies Solutions Pvt. Ltd.